All graduating seniors are invited to attend the Aloha Oe Ceremony and Luau to celebrate their accomplishments. The ceremony will be held at 8:00 p.m. on Wednesday, May 9, on the lawn in front of Ayres Hall. Graduating seniors should meet in the Alumni Memorial Building Cox Auditorium at 7 p.m. dressed in their caps and gowns to line up for the ceremony processional. In the event of inclement weather, the ceremony will take place in the auditorium. Following the Aloha Oe Ceremony seniors are invited to celebrate together at the Aloha Oe Luau held in the concourse area of Gate 21, Neyland Stadium. The Luau features food, music, giveaways, and more. This ceremony is a long-standing tradition that allows the Class of 2018 to come together, one last time, to bid farewell to UT. 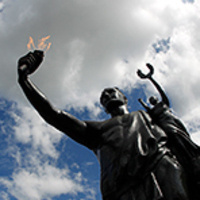 Seniors will pledge their loyalty to the university and pass the "Torch of Service," to their fellow students to inspire them to be leaders in their community. I think it was a great way to end my journey at the University of Tennessee. It was fun being able to be with all my friends and saying goodbye to the university we love.